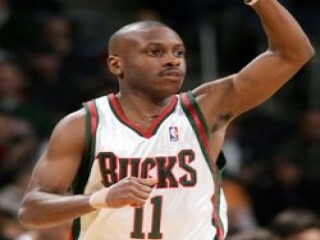 Earl Boykins is an American professional basketball player who is currently playing for the Milwaukee Bucks of the NBA. Standing at 5 feet, 5 inches in height, he is the second shortest player in NBA history behind Muggsy Bogues, who was 5 feet, 3 inches tall. Appeared in 67 games for Washington, started one, and averaged 6.6 points, 2.6 assists and 1.1 rebounds in 16.7 minutes per game ... shot 42.7 percent from the field and 86.5 percent from the free throw line ... had 17 games in double-digit scoring ... led the Wizards in scoring twice and in assists 10 times ... scored a season-high 20 points in his Wizards debut vs. Detroit (11/14) ... dished out a season-best nine assists at Miami (11/27) ... had 14 points, eight rebounds and five assists vs. Toronto (12/4) ... scored his 5,000th career point vs. Toronto (12/4) ... missed one game (3/19) due to a viral illness. Averaged 25.7 points per game in his senior year at Eastern Michigan...Boykins was an Honorable Mention All-America as a senior, when he finished second in the nation in scoring, and an All-Mid-American Conference First Team member as a junior and senior...He averaged in double figures in scoring in each of his four seasons, starting all but one of his 122 games played and averaging 18.1 ppg for his career...Boykins holds Eastern Michigan's career record for assists with 624 and ranks second on the scoring list with 2,211 points, behind former NBA player Kennedy McIntosh's 2,219. Full name is Earl Antoine Boykins … At 5-5, is the second shortest player in NBA history behind Muggsy Bogues, who was 5-3 ... idolized his father, Earl Williams, growing up ... native of Cleveland, OH where he played his high school basketball at Cleveland's Central Catholic High School ... can bench press 315 pounds ... led the U.S. 22-and-under team to the gold medal at the 1997 World University Games in Italy, leading the team with a 15.7 ppg average, earning USA Basketball’s Athlete of the Year recognition.